Apple has officially confirmed that it will hold an iPad press event slated to start at 10AM PST sharp on Wednesday, March 7 at the Yerba Buena Center in San Francisco. Apple is expected to release the third installment to the ever so popular iPad tablet, the iPad 3. 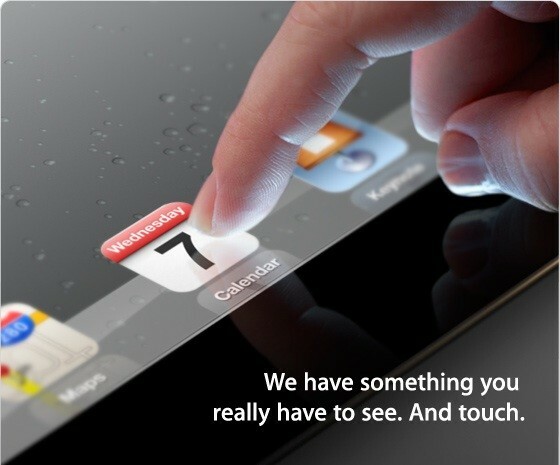 Until then, Apple's message on its 2012 iPad event press invite reads "We have something you really have to see. And touch." on top of what might be a home button-less, slimmer iPad 3 sporting a retina display and faster internal hardware.